The 2017 Research Experience for Undergraduate (REU) students and their mentors. For many students, especially during their undergraduate college years, the difference between thinking about potential careers and knowing what career they want to pursue boils down to one thing: experience. Thirty years ago, the National Science Foundation (NSF) recognized the role that hands-on research experience plays in attracting students to science, technology, engineering, and mathematics (STEM) fields, as well as preparing those students for careers in STEM-related areas. As a result, in 1987, NSF created the Research Experience for Undergraduates (REU) program, which provides students with opportunities to conduct research under the mentorship of faculty and staff researchers at institutions throughout the United States and abroad. The internships offer students travel and housing support, a modest stipend, and include research opportunities in a wide range of academic fields, such as applied physics, cyberinfrastructure, materials research, cognitive sciences and—BIOS’s specialty—ocean and atmospheric sciences. With close to 700 colleges, universities, and research institutions to choose from, students are encouraged to identify a project that aligns with their interests and anticipated career goals. In 2017, for three months beginning in September, seven students came to BIOS for their REU internships, representing majors in zoology; physics; ocean, earth, and atmospheric sciences; mechanical engineering; marine biology; biology; and psychology. 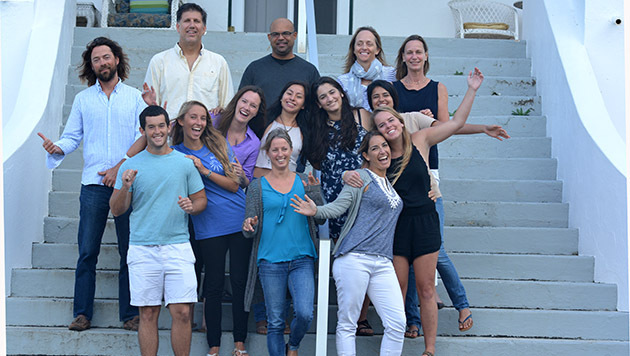 While each student brought with them a unique set of interests and academic experiences, they all left with an appreciation for the role that hands-on research plays in ocean science, as well as the challenges that come with it. In the past, BIOS REU interns have gone on to co-author papers in peer-reviewed scientific publications about their research; given presentations at national and international scientific conferences; and even returned to BIOS to accept jobs as teaching assistants or research technicians. 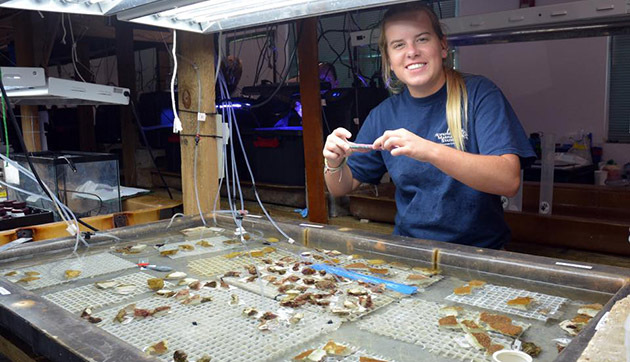 Kelly Chimpen MacLeod, a zoology major at Towson University in Maryland, worked with Yvonne Sawall, a postdoctoral researcher, and Eric Hochberg, a coral reef scientist, conducting research on photosynthetic reef organisms. While at BIOS, she used an experimental flow-through flume to measure the fluorescence and reflectance of corals, algae, and microbes. Understanding the relationship between these two parameters is necessary for researchers to accurately describe and quantify coral reef ecosystem functions. Gabrielle Dodson, a junior majoring in ocean, earth, and atmospheric sciences at Old Dominion University in Virginia, also worked alongside Hochberg. Using a profiling reflectance radiometer, she measured the amount of light entering the water column, and at what wavelength, at different reef locations around Bermuda. Dodson’s research will be used to determine whether the optical properties of seawater can be calculated from remote sensing images, rather than field-based measurements. 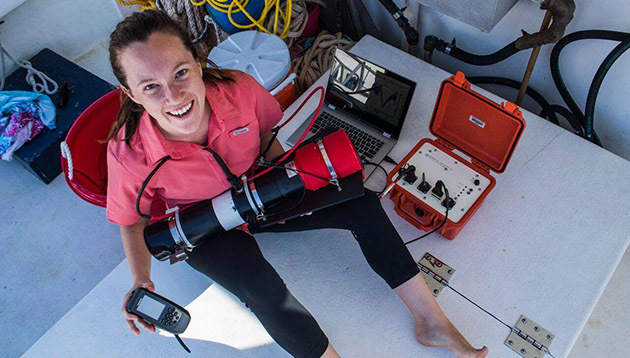 Gabrielle Dodson, a junior at Old Dominion University, worked with the PRR and other optical instruments while on board a BIOS research vessel. Aamna Jangda, a mechanical engineering major at Houston Community College in Texas, is interested in nanofluidics—the study of the mechanics of materials at a nanoscale (between 1 and 100 nanometers in size). While at BIOS, Jangda worked with Mark Guishard, a meteorologist with the Risk Prediction Initiative, using local observations and satellite-derived estimates to calculate the maximum potential intensity of land-falling storms. Alex Lundberg, a senior majoring in marine biology at the University of South Florida, worked with Gretchen Goodbody-Gringley, a coral reef ecologist, and Tim Noyes, a research specialist in the Coral Reef Optics and Ecology Lab. During his internship, he compared two different methods for evaluating deep-water reef fish communities. Lundberg’s work will be used to determine the most effective method for monitoring the effects of invasive, predatory lionfish in deep-water communities in Bermuda. Liah McPherson, a biology, psychology, and marine science major at the University of North Carolina at Chapel Hill, also worked with Yvonne Sawall and Eric Hochberg. Her research focused on understanding the relationship between the light reflected by coral reefs and the efficiency with which they utilize available light for metabolism and growth. Finding a correlation between these two parameters would mean that scientists could measure reflectance from instruments housed in airplanes or satellites and remotely predict the light-use efficiency of reefs. 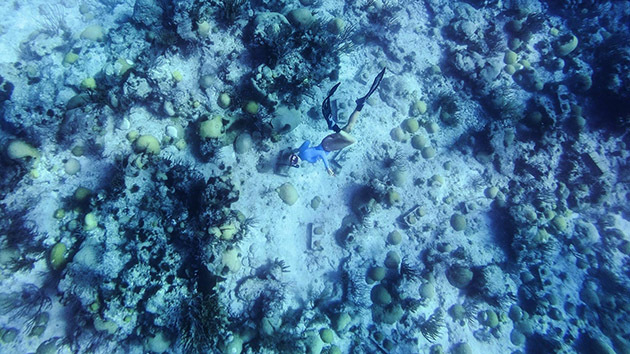 Liah McPherson, a student from The University of North Carolina at Chapel Hill, made free dives to the reef floor to film scientists returning corals used in flume studies. Emma Strand, a senior majoring in biology at Loyola Marymount University in California, also worked alongside Gretchen Goodbody-Gringley. Her research, conducted in cooperation with the Bermuda Government and the Bermuda Aquarium, Museum, and Zoo, aimed to assess an ecosystem-based approach to managing local baitfish populations. By using molecular techniques to reveal genetic diversity within the baitfish population, Strand helped researchers better understand the life histories of various baitfish species, as well as the genetic diversity within and between populations around the island. Emma Strand, a student from Loyola Marymount University, took pictures of corals in the lab to help estimate total surface area, which will then be used in calculations of respiration and calcification rates as the corals are exposed to varying temperatures.